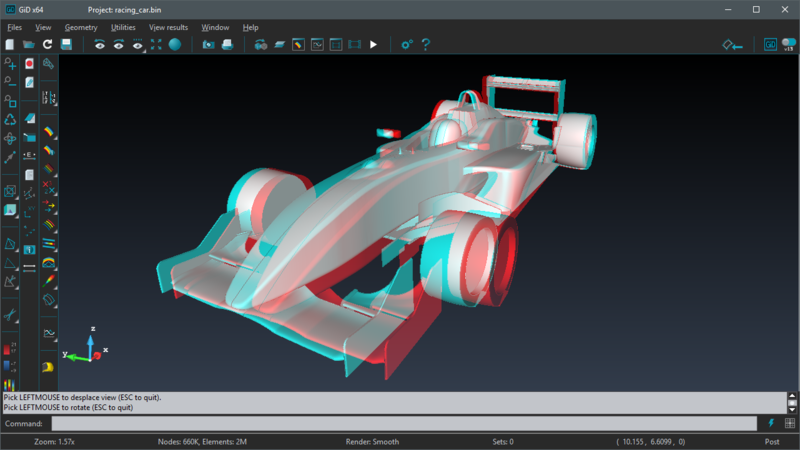 In GiD the model can be set as an anaglyphic image in order to provide a stereoscopic 3D effect, when viewed with 2 color glasses (each lens a chromatically opposite color, usually red and cyan). Anaglyphic images are made up of two color layers, superimposed. This option is very useful to get a better 3D perception of the model you are working with or to create more realistic animations. In order to activate the stereoscopic mode just go to View->Advanced viewing settings to open the window and check the Use stereo option. This mode can be activated both in preprocess and postprocess. If you want to use a 3D red-cyan glasses make sure you have selected the Anaglyph colors in the stereo mode option. You will need to adjust the eye distance option until you are able to see the 3D effect. Another way to improve the 3D experience is switching to full screen mode. Learn how to do it with this tip. You can also combine the stereoscopic view with the shadows effect in order to improve the 3d perception. Learn more about the shadows effect with this tip. Find more information about this option in the GiD reference manual.